Records, Rollovers, Spins and Spills – That’s Just The Season Opener. Home » Records, Rollovers, Spins and Spills – That’s Just The Season Opener. 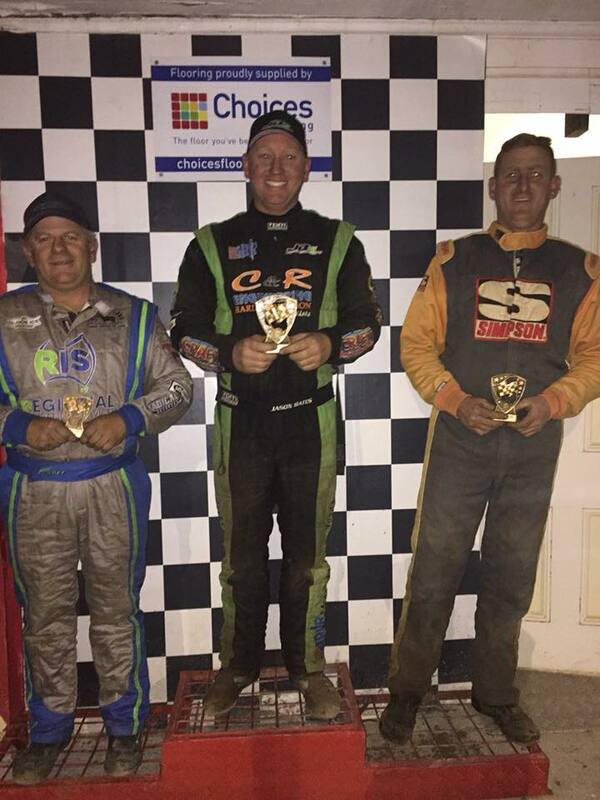 Jason Bates last night picked up where he left off last season winning the opening round of the NSW Championship and Round 1 of the NSW Country Series. He was top pointscorer after the heats by virtue of a heat win and second place. Continuing his fine form from last season and breaking a new club record by winning 5 consecutive race meetings, he took the early lead of the A main. He didn’t have it all his way though, Sean Dicker looked fast from the get go and took over the lead on lap 9. A stoppage on lap 13 reset the field. This was when Bates made his move around the top of the racetrack to eventually secure the opening win of the season. Sean Dicker, who was celebrating his birthday, held off a last lap challenge from a quick Troy Carey to secure 2nd place. Sean, running the Craft Differentials 21, had great pace all night and was rewarded with the second step on the podium. Home in 3rd was Tullamore’s Troy Carey. Starting out of 4 in the A main, he showed good speed all night with a heat win and definitely showing some good pace after his recent stint in the Northern Territory. 4th over the line was Zac Pacchiarotta, who showed some outstanding car speed, he looked threatening during the main, hovering in the top 3 for most of the race. Cody Boulding rounded out the top 5. The young racer put a solid effort in to make his way forward on tricky track conditions. 6th over the line was Jamie Dicker, followed by Mark Blyton, Andrew Seery, Ashleigh Jack, Jamison Blyton, Parker Eveleigh, Simon Bestman, Jack Gray, Amy Shute and Peter Granger. Non finishers were Andrew Sayre, Jason Davis, Marshall Blyton, Nathan Dicker and John McRae. Hard charger of the night goes to Mark Blyton, after clipping a wheel and going over in heat 1, he sustained considerable damage. In a true show of sportsmanship from other drivers lending a hand, Blyton made it back out for his 2nd heat. Having to come through the B main he made it up as far as 5th position before an incident with another car saw him relegated to the rear. 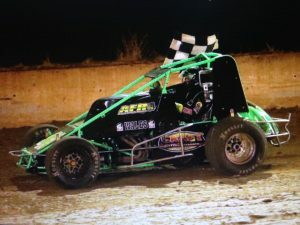 Notable mentions go to youngsters Parker Eveleigh, who made his first Top 10 finish and Amy Shute who put in a fantastic drive to make her first Wingless feature race. A tough night for Luke Sayre with car issues during the heats, then a roll over in the opening lap of the B Main saw his night finish early. After winning his first heat, Brock Gardiner also struck some bad luck ending his night early with motor issues. The new season also brought some new drivers to the division, great job by Andrew Smith and Jaidyn Boulding to make it through their first race meeting. The NSW Wingless Sprints are back next week at Sydney’s Valvoline Raceway for Round 2 of the NSW Championship.